Welded stainless steel pipe production, the main industry is the nominal pipe diameter of more than DN700 in the production pipeline. Slotted pipe not only includes the straight pipe, and comprises a spiral weld pipe. The main specifications and production of welded stainless steel pipe with nominal diameter 700mm multiplied by the thickness of 10mm (denoted as 711×10), nominal pipe diameter 800mm multiplied by the thickness of 12mm (denoted as 813×12), multiplied by the nominal pipe diameter 900mm 14mm thick steel plate (denoted as 914×14), multiplied by the nominal diameter 1000mm 18mm thick (expressed as 1016 x18) and other product specifications. 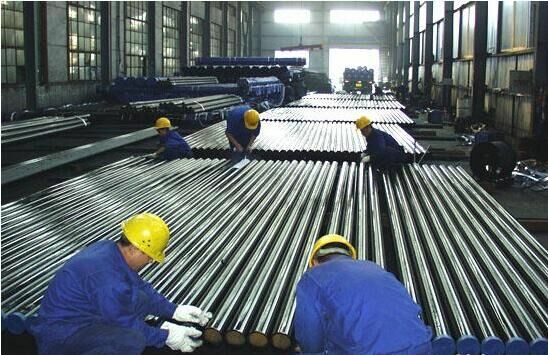 In the production of welded stainless steel pipe, the first step is to identify the material of stainless steel plate. Determine the stainless steel pipe material and the circumference of the steel pipe, while purchasing the corresponding material, width and steel plate perimeter of the same level of stainless steel plate. Enter the production site after surface inspection of steel plate according to the forming of the steel plate, steel plate or oxide scale is determined, no pits or less cellular, and less area of on-site grinding or sandblasting. Nondestructive testing followed by the end of the plate, here is generally used in penetrant inspection, is the first to end with a cleaning agent for cleaning and dry, then spray stains, wait a few minutes later, wipe the stains, spray on the imaging agent, wait a few minutes after the end of observation is there red lines to confirm whether there are defects in stainless steel plate. Then the steel plate on both sides or a single side of the ultrasonic testing, ultrasonic wave to determine whether the steel plate defects. The steel plate after the test is finished, the second step is the first rolling, rolling machine press select the corresponding arc, and then put into the steel plate rolling machine under rolling, the stainless steel plate rolled into a cylindrical slowly. Followed by the third step of the pre welding, pre welding, if the machine is submerged arc welding, but also must be welded at both ends of the steel arc plate, and then welding. The welding process is divided into priming and filling and cover. After the completion of welding work, is to do NDT, for ray by RT ray of steel pipe welding, welding internal confirmation does not appear root not melting, unweld, welding slag, stratification, large quantities of gas welding defects. Then the pipeline pressure test process, in accordance with the design pressure of 1.5 times the water pressure test of the pipeline, to ensure that the pipeline under the pressure intensity, no structural deformation of the pipeline, no leakage, pressure to maintain stability, etc.. Finally, the heat treatment of steel pipe welding, after a period of time so that the temperature between the weld to maintain a heat treatment temperature value of a few minutes to half an hour, and then slowly cooling, the production of steel pipe is basically completed. The remaining task is to carry out the identification of pipeline spraying and anti-corrosion work. The contents include the name of the manufacturer, the specification of the pipe, the material of the pipeline, the batch number of the pipeline, and the corrosion grade requirements of the pipeline. After a series of work, a small steel plate into a gas, liquid and other media to the pipeline. In order to ensure the quality of the pipeline, before leaving the factory, but also the need for review of pipeline materials, usually on the same batch of pipeline inspection, the spectral and hardness of the review. Then check the size of the pipeline, and finally signed on the production list to complete.